Possessing a rich source of antioxidants, polyphenols, honey can protect the liver from oxidative stress and liver cell damage. Research studies have pointed to the positive effects of the strong antioxidant activity in honey. Bile is a digestive liquid made in the liver that passes through special bile ducts and collects in the gallbladder to help you digest food. Gallstones, inflammation or even tumors can block bile ducts and cause damage to the liver. A study concluded that when given to rats with bile duct obstruction, consumption of honey can help in liver cleansing and protect the liver from injury (World Journal of Gastroenterology, June 2008). Another study showed that the antioxidant properties from the phenolic and flavonoid content of honey were able to protect against free radical scavengers and paracetamol-induced liver damage (Food Funct, July 2015). Honey could protect the liver from toxins. To assess the protective capacity of honey, rats were given a potent liver toxin to rats, with and without honey. The rats without the honey sustained significant liver damage, however, in the other group of rats, honey protected the liver and kidneys against toxicity and improved their cholesterol. It was hypothesized that the antioxidant activity of honey was responsible for the liver-protecting effect (Evidence Based Complementary and Alternative Medicine, 2013). The liver, along with the pancreas, plays a role in controlling blood sugar. For those who are overweight and have risk of fatty liver disease and diabetes, honey supplementation can be beneficial in controlling blood sugar through a series of metabolic processes. (International Journal of Biological Sciences, July 2012). Inadequate glycogen storage in the liver causes a release of stress hormones which in the long run can lead to an impairment of glucose metabolism, insulin resistance and fatty liver disease. Honey contains a rich amount of nutrients, bioflavonoids and organic acids which are metabolized in a different way compared to refined sugars. It comprises 70-80% simple sugars which the liver easily assimilates. Its sugar-fructose is almost entirely used for glycogen synthesis (liver sugar in the liver). The 1:1 ratio of fructose to glucose that allows a sufficient supply of glycogen storage in liver cells. Taking 1-2 tablespoons of honey before going to bed will nourish the liver, provide the brain with energy during the night and help in having a restful sleep. (Honey Diet, 2014). Honey has been associated with improved liver health and a reduced risk of liver disease. Our digestive system hosts friendly bacteria that are crucial for healthy digestion. A healthy liver which has a balance of gut bacteria has better resistance against damages. A great source of good bacteria, raw honey contains six species of lactobacilli and four species of Bifidobacterium that can boost liver health and effectively remove toxins from the body (Biology and Medicine, 3 (1): 1-5, 2011). 1.How can you use an easy honey diet to fuel your liver for the night, burn body fats when you sleep and, speed up fat metabolism? Read: 4 Science-Backed Facts About Honey Diet for Hibernation. 2. Astonishing health and nutrition findings from The Honey Revolution by Dr Ron Fessenden that cast much light on several well-known myths and theories about dieting and sugar: Health and Nutrition: 5 Jolting Findings. 3. Going to the bathroom too frequently at night? A daily dose of honey before bed time can help: Having to Go to the Bathroom at Night too Frequently? 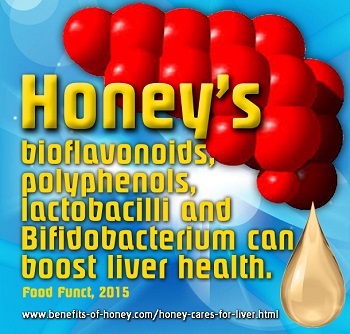 End of 3 Ways Honey Cares for Your Liver. Back to "3-Day Honey Water Fasting Tips"